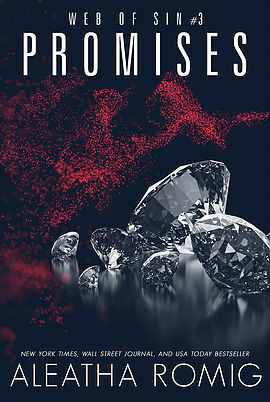 In this action packed conclusion, Promises brings danger, drama, and unstoppable love to it’s pages, before wrapping up every loose end in a stunning and completely satisfying finish to the Web of Sin trilogy. As Araneae and Sterling get closer to the truth of the past, the danger they face gets closer and closer. With the building of new relationships and the uncovering of many a long held secret, when high powered people want their secrets to stay hidden, no one is safe. With the conclusion of the trilogy returning with the highly suspenseful storyline of book one, I was delighted to also see more of the hot sexual encounters that I felt were lacking in book two. With all of the moving parts and missing components in the past that Araneae and Sterling are trying to get to the bottom of, I was left at the end of this trilogy feeling incredibly pleased with how Aleatha Romig was able to weave this complicated story together so beautifully.